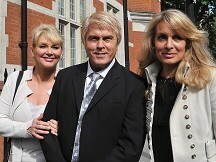 But the fourth member of the original line-up, Bobby G, recruited three new members including his wife Heidi Manton, who now owns the copyright of the name Bucks Fizz. When Cheryl, Mike and Jay tried to trademark their band name, The Original Bucks Fizz, Bobby G - real name Robert Gubby - objected. This led to a counter objection against his use of Bucks Fizz. Principal hearing officer at the Intellectual Property Office (IPO) Allan James heard evidence on Friday from both sides and said he would give a final decision in five to six weeks. Speaking after the hearing Baker said: "He [Gubby] has no right to stop us from working. We don't want it all but we do want our share. "We've got an album that should have been released by now and we can't because of the dispute over the name, so it's affecting our livelihood."